It has been exactly 100 years since a man called Frederick Twort, a man of apparently limited financial means working at the Brown Institution, a Centre for veterinary medicine in London, reported the fortunate results of his “unfortunate avenue of research” towards discovering cell-free or artificial conditions for growing viruses that do not cause disease. Instead, what he discovered was the presence of “watery-looking” or “glassy and transparent” areas within the cultures of bacteria, which he called micrococci, in the biological material used for smallpox vaccination. These glassy areas were devoid of bacteria and were merely “granules, staining red with Giemsa”, he reported. This disease of the micrococci was transmissible over generations. The glassy material, when taken on the tip of a pin and placed on an otherwise healthy colony of the micrococci, caused the symptoms of the glassy appearance in these colonies. The disease could spread among young, actively growing bacteria but not on elderly ones. The glassy, filterable and heat-sensitive material could not be grown in the absence of the bacteria. This agent, which killed the micrococci, showed some activity against Staphylococci isolated from humans, but not against more distant bacteria such as coliforms and Mycobacteria. Twort’s paper reveals what appears to be a major conflict in his mind about the identity of the agent that was responsible for the disease of the micrococci. He wonders if this represents a form of life “more lowly organised” than bacteria. Or is this an “enzyme with power of growth” and produced by the micrococci themselves? He believed that the killing agent cannot be a new form of life because a purified micrococci culture that is normally healthy does sporadically display the formation of the glassy character. Though he wonders that it could be because the micrococci have probably not been 100% purified of the killing agent; if this could be ruled out, then it becomes apparent that the killer has to originate from within the bacterium. That said, Twort concedes that “the possibility of its being an ultra-microscopic virus has not been definitely disproved.” At the end of the day, Twort does not seem to be sure of what he has discovered and regrets that his financial situation did not quite allow him to take his studies to their logical conclusion. Today, we credit Twort with the discovery of the bacteriophage, a virus that preys on bacteria. This is the simple form of life that was instrumental in the birth of molecular genetics: from the establishment of DNA as the genetic material, through discoveries of the mechanisms of non-vertical gene transfer and evolution, to an understanding of gene regulation. However, in the early days of the bacteriophage, its action was referred to as the “d’Herelle phenomenon” and not the “Twort phenomenon”. Who was d’Herelle and what was his contribution to bacteriophages? For one, it was d’Herelle who gave the bacteriophages their moniker! Two years after Twort’s discovery was published, Felix d’Herelle published his short paper describing his own discovery of bacteriophages in patients suffering from bacterial dysentery. d’Herelle established an association between increasing concentration of the bacteriophage and a decrease in the bacterial load in the patient. He showed how the bacteriophage could be evolved to infect a related bacterium, but not one that is more distant phylogenetically. However, d’Herelle did not cite Twort, and it remains unclear whether he was being dishonest in doing so or whether he was genuinely unaware of Twort’s finding. d’Herelle’s discovery was initially better known than Twort’s work. Curiously however, Twort’s discovery seems to have found the limelight a few years later for the wrong reasons. Certain scientists believed that the killing agent could not have been a form of life and had to be a chemical agent, an idea that had indeed been discussed by Twort. This discovery led to the realisation that, irrespective of what the killing agent was, the discovery of the phenomenon of the transmissible killing of bacterial colonies by a certain pathogen should be credited to Twort and not to d’Herelle. Unlike a similar situation, which had risen in the 1890s with the discovery of the tobacco mosaic virus, in which the later discoverer of the virus apologised for his ignorance of a previous discovery of the same, d’Herelle took to defending his side of the story. He started to claim that he had discovered the phenomenon in 1910 when studying bacteria that killed locusts. Though he had previously reported the existence of these locust-clearing bacteria he had never mentioned his observation of bacteriophages here. This might well have been an honest oversight that d’Herelle might have come to regret later. However, the fact that this story emerged only after his claim to fame was questioned, and that he had egregiously claimed that Twort’s agent was not transmissible, discredited d’Herelle in the minds of several commentators. d’Herelle might well have discovered the bacteriophage before Twort did, but his reaction to the discovery of Twort’s work appears to have been the major factor going against him. 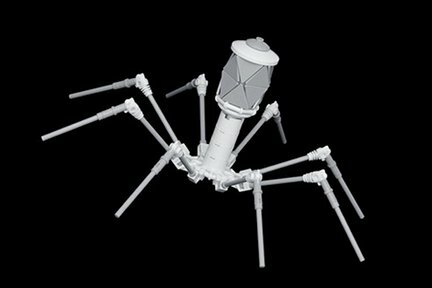 In any case, d’Herelle’s further contribution to the biology of bacteriophages including a model for their population growth and the suggestion of bacteriophage therapy for bacterial infections remains uncontested. Of course, the true nature of the bacteriophage was not confirmed until Helmut Ruska and colleagues viewed it under an electron microscope in the late 1930s. The story cannot be complete without the mention of ~30 papers, published before Twort’s work, which might have referred to bacteriophages, though none seem to have made the connection. One famous example is the description of the antibacterial properties of water from the Ganges by Hankin. Many do believe that Hankin discovered the bacteriophage, but Hankin’s statement that the water retained its antibacterial activity even after being heated to ~115 degrees in hermetically sealed tubes argues against this possibility for others. In any case, I believe that the legacy of Twort and d’Herelle remain safe in the annals of molecular biology.